GamerNode proudly welcomes Chris Spann to pen the Glutton for Punishment column: detailed accounts of the most punishing experiences in gaming. You can find Chris on Twitter @cs87, and you can find the inspiration for Glutton for Punishment at Chris’s blog, Spann Does Dark Souls. Now, without further ado, here comes the pain. 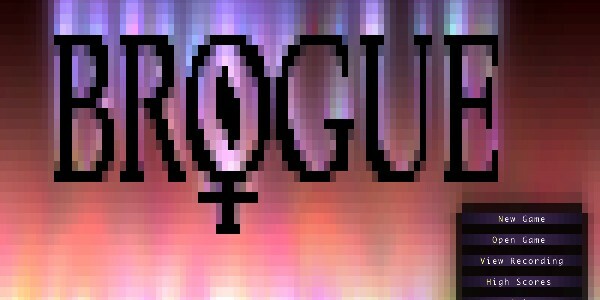 Those are words that you can see within five minutes of sitting down to play Brogue, a roguelike game that is often touted as an easy introduction to the genre. 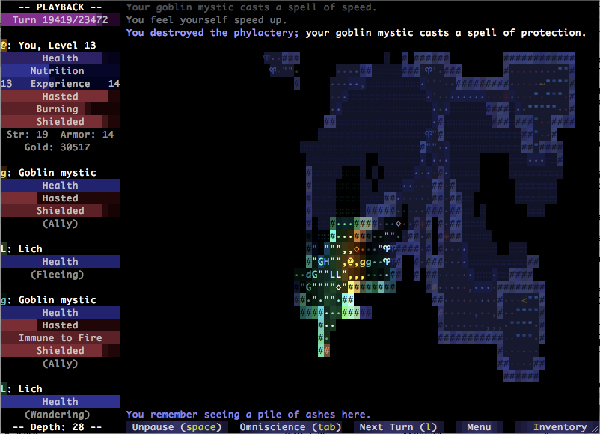 It’s worth remembering that roguelikes aren’t like normal games, however: If you think Dark Souls is difficult, imagine playing a version of Dark Souls where you have to worry about hunger, where you don’t know what ANY of the potions or trinkets you pick up actually do, and where the entire terrifying world around you is represented in ASCII characters. It’s absolutely pig-in-a-motorboat bonkers, is what I’m trying to say. The whole game is randomized. Your introduction to the game is a line of text that tells you that you’re searching for some amulet or something, and that if you’re so insistent on being told what buttons do what, like some sort of MASSIVE GIRL, you can press the Question Mark key to find out LIKE THE MASSIVE SISSY YOU ARE. You know how Dark Souls is good because it’s so fair? Well Brogue doesn’t play fair. At all. Low on health? Why not try drinking that potion you found? After all, it might heal you! Of course, it might also make you hallucinate, completely impede your ability to walk in a straight line (something that has resulted in me almost drowning, losing all my items, then falling down a hole before now). And remember, this is an EASY roguelike. You’ll save a monkey. That monkey will become your friend. Then that monkey will hurl itself to its death, following you off the edge of a chasm that has opened in the floor because you picked up a key. You will mourn the monkey. Then, a goblin will invariably prod you in the face until you unwittingly use a scroll of enrage monsters (Because OF COURSE there’s a scroll of enrage monsters) and everything on that floor of the dungeon trips over itself to come and tear your pour beleaguered head off your neck and kick it across the whole room. You’ll charge into a room, only to be set upon by a pink jelly that will split into two every time you attack it, or worse, a bloat, which is essentially a big fleshy balloon full of farts and sick fumes and morning breath, which will fill a room if you so much as brush past it with an angry look on your face. Brogue is openly hostile toward players at all times, just like most roguelikes. Sure, the game is rendered in pretty colors that help you to forget that you are making an @ sign navigate its way around a grid of full stops and trying to avoid the lower case bs, (and everything gets even brighter if you accidentally drink that hallucination potion) but it’s still a game that routinely says to players, “Oh look, you found something. Why don’t you use it and see what happens?” then immediately sets you on fire when you do so. It gives you a spear that you aren’t strong enough to use properly, but doesn’t explain what this means, and when you consult the wiki, you learn that it means “each point of strength beyond what is required to equip the weapon or armor provides an additional 0.25 enchant level. Conversely, for every point of strength that you are short of the strength requirement, the enchantment level is reduced by 2.5,” which means, if you’re me at least, precisely ten percent less than absolutely bloody nothing. I just played another game and got killed by a centipede. Seems they make you extremely weak, and then prod you to death. A centipede. To “beat” Brogue, you have to descend through 26 levels of lava, dragons, slime, unlabeled potions, and other assorted torture, retrieve the Amulet of Yendor, and then leave the dungeon. If you die, that save is wiped, the world re-randomized, and you have to start again. I have never come close to beating Brogue. I have plunged through holes created by potions that I’ve drank, I’ve burned to death because I’ve fallen for a trap, and a whole library of other hilarious, demeaning, and unfair deaths – and yet I keep coming back for more. Why? Well, the game is chock full of surprises: In the last game I played I saw my first captive ogre, whom I imagine would have been a great ally had I slain his captors and freed him as opposed to opening a potion of poisonous gas and choking myself to death. I keep seeing pressure plates that I can’t reach that (I assume) open locked doors. I’ve heard there are unicorns. I’ve heard there are dragons (which, due to the game’s “graphics,” occupy exactly the same amount of space as a centipede. I’ve lost my monkey ally somewhere in the depths only to come across him fighting another monkey to the death. I’ve melted and exploded and choked and bled and hallucinated and tumbled and descended and every single time you play the game you’re provided with a completely different, exciting and wonderful adventure that will almost certainly end when your hero dies a death he had no idea was coming and couldn’t prepare himself for and is completely unfair *BREATH*, but you’ll laugh, and then you’ll cry, and then you’ll hit “new game” again and you’ll start trawling through the game again, waiting for Brogue to show you something you haven’t seen before. This ain’t your Grandad’s Dark Souls. This is a genre that’s, erm, a lot older than that, but it massages that gland inside all of us (no, not that one) – the one that squirts endorphins into your brain every time you imagine yourself as a fearless explorer, a Nathan Drake without the sass and the needless human body count. Brogue. It’s fun. It’s mind-bending and cruel and it’ll kill you as soon as look at you, but it’s fun. Man, I really am a glutton for punishment. GamerNode proudly welcomes Chris Spann to pen the Glutton for Punishment column: detailed accounts of the most punishing experiences in gaming. You can find Chris on Twitter @cs87, and you can find the inspiration for Glutton for Punishment at Chris's blog, Spann Does Dark Souls. Now, without further ado, here comes the pain.